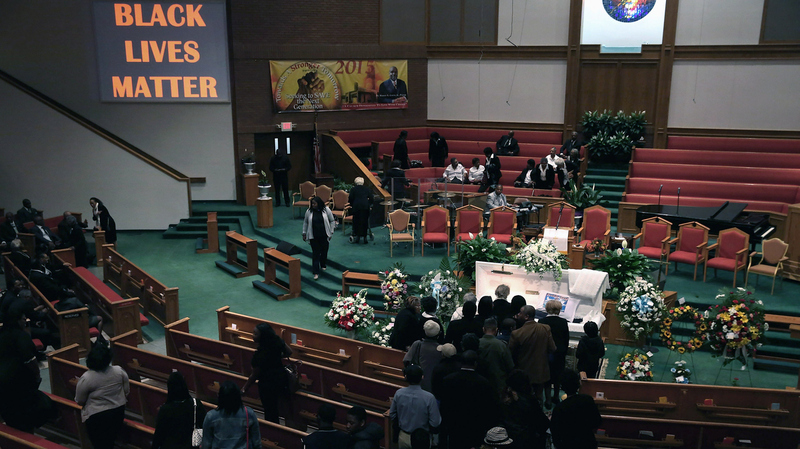 Freddie Gray's Funeral Spurs Calls For Calm In Baltimore : The Two-Way After a weekend that saw violence and arrests, Gray's family and many public and religious figures are calling for peace. Mourners line up to pay their respects during Freddie Gray's funeral at the New Shiloh Baptist Church in Baltimore, Md., on Monday. In Baltimore, the funeral of Freddie Gray, the 25-year-old black man who died after being arrested, was held Monday. Gray's family and many public figures are calling for peace, after a weekend that saw violence and arrests. "We must not allow an already tragic situation to tear our community apart," Sen. Barbara Mikulski, D-Md., said in a statement. Mourners who paid their respects to Gray before the service at the New Shiloh Baptist Church saw a large electronic billboard on the wall of the sanctuary that stated, "Black Lives Matter." Gray died on April 19 after an acute spinal cord injury left him in a coma. He had been arrested after a foot chase and placed in a police van. In the week after his death, protests grew larger and less peaceful. Mayor Stephanie Rawlings-Blake and many of the city's religious leaders are calling on protesters to respect Baltimore's history of peaceful demonstrations. Rep. Elijah Cummings and Gray's family also have asked for justice — not violence — in the case. From Baltimore member station WYPR, P. Kenneth Burns reports that "a wake Sunday drew protesters to the Vaughn C. Greene Funeral Home on York Road in North Baltimore despite requests from family for no protests." More than 30 people were arrested Saturday, as demonstrations sparked vandalism and clashes with officers. At least two members of the media were reportedly arrested; a photo editor for a local weekly tells The Baltimore Sun that he was "was hit in the head with multiple police shields." Burns quotes City Council President Jack Young as saying Sunday night that "the righteousness of the many was perverted by the misdeeds of a few." You can read more of NPR's coverage of the case here. In one Baltimore neighborhood, some protesters faced off with police, Monday afternoon. Television images showed those demonstrators throwing rocks, bricks and bottles at a line of police in riot gear. CNN reported that some protesters set a trash can on fire and a helicopter swooped low over them to warn that the gathering had become unlawful.